Most scapula fractures can be managed effectively with closed treatment. Some injuries with significant displacement have poor long-term outcomes for the shoulder and the upper extremity as a whole if treated with closed techniques. This article reviews closed management of scapula fractures, discusses open treatment, and provides guidelines for injuries that require operative intervention. The scapula serves as the attachment site for 18 muscles, which link it to the thorax, spine, and upper extremity. (See the image below.) The subscapularis covers the anterior surface, and the serratus anterior attaches to the inferior angle along the anterior medial border. The supraspinatus and the infraspinatus lie on the posterior border of the scapula. Overlying them is the trapezius, which inserts on the spine and the clavicle. The deltoid originates from the scapular spine, acromion, and anterior clavicle. Many other muscles attach to the scapular margins. (Click Image to enlarge.) Scapular anatomy. Muscle origin and insertion. The coracoid process projects from the superior border of the scapula. The coracobrachialis and the short head of the biceps originate from the coracoid, and the pectoralis minor inserts on the coracoid. The brachial plexus and the axillary artery run posterior to the pectoralis minor tendon. The scapular notch lies just medial to the coracoid base and is covered by the transverse scapular ligament. The suprascapular nerve runs under the ligament, and the suprascapular artery passes over it. The acromion is the lateral projection from the spine of the scapula. The spinoglenoid notch is the gap between the acromion and the glenoid neck of the scapula. The suprascapular nerve and vessels pass through the notch en route to the infraspinatus. Typically, scapula fractures result from high-energy trauma. Direct forces are most common, but indirect mechanisms can also be responsible. An example of an indirect force is a fall on an outstretched arm that causes the humeral head to impact on the glenoid cavity. Scapula fractures account for 1% of all fractures, 3% of shoulder girdle injuries, and 5% of all shoulder fractures. Approximately 50% of scapula fractures involve the body and spine. Fractures of the glenoid neck constitute about 25% of all scapula fractures, whereas fractures of the glenoid cavity (glenoid rim and fossa) make up approximately 10% of scapula fractures. 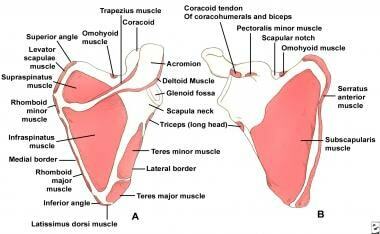 The acromial and coracoid processes account for 8% and 7%, respectively. Hardegger FH, Simpson LA, Weber BG. The operative treatment of scapular fractures. J Bone Joint Surg Br. 1984 Nov. 66 (5):725-31. [Medline]. Tadros AM, Lunsjo K, Czechowski J, Abu-Zidan FM. Multiple-region scapular fractures had more severe chest injury than single-region fractures: a prospective study of 107 blunt trauma patients. J Trauma. 2007 Oct. 63(4):889-93. [Medline]. Herrera DA, Anavian J, Tarkin IS, Armitage BA, Schroder LK, Cole PA. Delayed operative management of fractures of the scapula. J Bone Joint Surg Br. 2009 May. 91(5):619-26. [Medline]. Coimbra R, Conroy C, Tominaga GT, Bansal V, Schwartz A. Causes of scapula fractures differ from other shoulder injuries in occupants seriously injured during motor vehicle crashes. Injury. 2010 Feb. 41(2):151-5. [Medline]. Kennon JC, Lu C, McGee-Lawrence ME, Crosby LA. Scapula fracture incidence in reverse total shoulder arthroplasty using screws above or below metaglene central cage: clinical and biomechanical outcomes. J Shoulder Elbow Surg. 2017 Jun. 26 (6):1023-1030. [Medline]. Kavanagh BF, Bradway JK, Cofield RH. Open reduction and internal fixation of displaced intra-articular fractures of the glenoid fossa. J Bone Joint Surg Am. 1993 Apr. 75(4):479-84. [Medline]. Cole PA, Talbot M, Schroder LK, Anavian J. Extra-articular Malunions of the Scapula: A Comparison of Functional Outcome Before and After Reconstruction. J Orthop Trauma. 2011 Nov. 25(11):649-56. [Medline]. Anavian J, Wijdicks CA, Schroder LK, Vang S, Cole PA. Surgery for scapula process fractures: good outcome in 26 patients. Acta Orthop. 2009 Jun. 80(3):344-50. [Medline]. [Full Text]. Gosens T, Speigner B, Minekus J. Fracture of the scapular body: functional outcome after conservative treatment. J Shoulder Elbow Surg. 2009 May-Jun. 18(3):443-8. [Medline]. Schofer MD, Sehrt AC, Timmesfeld N, Störmer S, Kortmann HR. Fractures of the scapula: long-term results after conservative treatment. Arch Orthop Trauma Surg. 2009 Nov. 129(11):1511-9. [Medline]. Anavian J, Gauger EM, Schroder LK, Wijdicks CA, Cole PA. Surgical and functional outcomes after operative management of complex and displaced intra-articular glenoid fractures. J Bone Joint Surg Am. 2012 Apr 4. 94 (7):645-53. [Medline]. Lewis S, Argintar E, Jahn R, Zusmanovich M, Itamura J, Rick Hatch GF. Intra-articular scapular fractures: Outcomes after internal fixation. J Orthop. 2013. 10 (4):188-92. [Medline]. Armitage BM, Wijdicks CA, Tarkin IS, Schroder LK, Marek DJ, Zlowodzki M, et al. Mapping of scapular fractures with three-dimensional computed tomography. J Bone Joint Surg Am. 2009 Sep. 91(9):2222-8. [Medline]. Dugarte AJ, Tkany L, Schroder LK, Petersik A, Cole PA. Comparison of 2 versus 3 dimensional fracture mapping strategies for 3 dimensional computerized tomography reconstructions of scapula neck and body fractures. J Orthop Res. 2018 Jan. 36 (1):265-271. [Medline]. Bartonicek J, Klika D, Tucek M. Classification of scapular body fractures. Rozhl Chir. 2018 Winter. 97 (2):67-76. [Medline]. [Full Text]. Ada JR, Miller ME. Scapular fractures. Analysis of 113 cases. Clin Orthop Relat Res. 1991 Aug. (269):174-80. [Medline]. Goss TP. Scapular Fractures and Dislocations: Diagnosis and Treatment. J Am Acad Orthop Surg. 1995 Jan. 3(1):22-33. [Medline]. Morioka T, Honma T, Ogawa K. Incomplete avulsion fractures of the scapular spine caused by violent muscle contraction. Keio J Med. 2014. 63 (1):13-7. [Medline]. Ideberg R, Grevsten S, Larsson S. Epidemiology of scapular fractures. Incidence and classification of 338 fractures. Acta Orthop Scand. 1995 Oct. 66 (5):395-7. [Medline]. Goss TP. Fractures of the glenoid cavity. J Bone Joint Surg Am. 1992 Feb. 74 (2):299-305. [Medline]. Jaeger M, Lambert S, Südkamp NP, Kellam JF, Madsen JE, Babst R, et al. The AO Foundation and Orthopaedic Trauma Association (AO/OTA) scapula fracture classification system: focus on glenoid fossa involvement. J Shoulder Elbow Surg. 2013 Apr. 22(4):512-20. [Medline]. Audigé L, Kellam JF, Lambert S, Madsen JE, Babst R, Andermahr J, et al. The AO Foundation and Orthopaedic Trauma Association (AO/OTA) scapula fracture classification system: focus on body involvement. J Shoulder Elbow Surg. 2014 Feb. 23 (2):189-96. [Medline]. Gilbert F, Eden L, Meffert R, Konietschke F, Lotz J, Bauer L, et al. Intra- and interobserver reliability of glenoid fracture classifications by Ideberg, Euler and AO. BMC Musculoskelet Disord. 2018 Mar 27. 19 (1):89. [Medline]. [Full Text]. DePalma AF. Surgery of the Shoulder. 3rd ed. Philadelphia: Lippincott Williams & Wilkins; 1983. Soslowsky LJ, Flatow EL, Bigliani LU, Mow VC. Articular geometry of the glenohumeral joint. Clin Orthop Relat Res. 1992 Dec. 181-90. [Medline]. Nordqvist A, Petersson C. Fracture of the body, neck, or spine of the scapula. A long-term follow-up study. Clin Orthop Relat Res. 1992 Oct. (283):139-44. [Medline]. Herscovici D Jr, Fiennes AG, Allgöwer M, Rüedi TP. The floating shoulder: ipsilateral clavicle and scapular neck fractures. J Bone Joint Surg Br. 1992 May. 74 (3):362-4. [Medline]. Burke CS, Roberts CS, Nyland JA, Radmacher PG, Acland RD, Voor MJ. Scapular thickness--implications for fracture fixation. J Shoulder Elbow Surg. 2006 Sep-Oct. 15(5):645-8. [Medline]. Lantry JM, Roberts CS, Giannoudis PV. Operative treatment of scapular fractures: a systematic review. Injury. 2008 Mar. 39(3):271-83. [Medline]. Cole PA, Dubin JR, Freeman G. Operative techniques in the management of scapular fractures. Orthop Clin North Am. 2013 Jul. 44(3):331-43, viii. [Medline]. Harmer LS, Phelps KD, Crickard CV, Sample KM, Andrews EB, Hamid N, et al. A Comparison of Exposure Between the Classic and Modified Judet Approaches to the Scapula. J Orthop Trauma. 2016 May. 30 (5):235-9. [Medline]. Illustrations depicting fixation techniques available for stabilization of fractures of the glenoid cavity. (1) interfragmentary compression screw; (2) Kirschner wires; (3) construct using Kirschner wires and cerclage wires or Kirschner wires and cerclage sutures; (4) cerclage wire or suture; (5) staple; and (6) 3.5-mm malleable reconstruction plate. Fixation of glenoid neck fractures. (A) stabilization with a 3.5-mm malleable reconstruction plate (note the Kirschner wire running from the acromial process to the glenoid process that can be used for either temporary or permanent fixation); (B) stabilization with 3.5-mm cannulated interfragmentary screws; and (C) stabilization with Kirschner wires (in this case, Kirschner wires passed from the acromion and clavicle into the glenoid process). Illustrations showing techniques for managing coracoid fractures. (A) interfragmentary screw fixation (if the fragment is sufficiently large and noncomminuted), and (B) excision of the distal fragment (if small and/or comminuted) and suture fixation of the conjoined tendon to the remaining coracoid process.